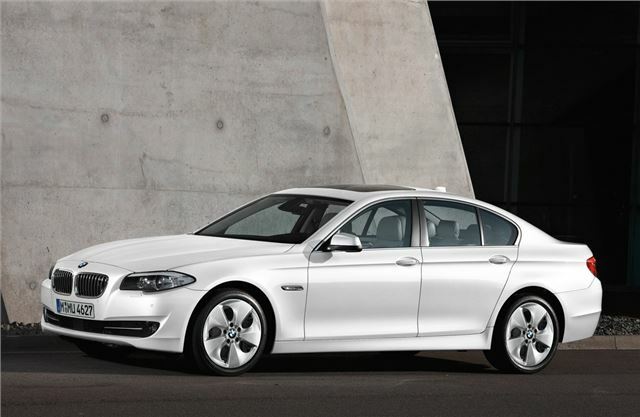 BMW will launch its most efficient 5 Series ever in September when the 520d EfficientDynamics saloon goes on sale. Thanks to a host of changes the cleaner 520d emits an incredibly impressive 119g/km of CO2 which means annual VED of just £30 while it's capable of a claimed 62.8mpg. It will cost £30,435 on the road. Aimed at the important UK business market, the low CO2 figure means a company car benefit-in-kind taxation band of only 13 per cent. Yet the engine power remains unchanged with the same 184hp and 380Nm of torque from the 2.0-litre diesel engine. To help reduce emissions the 520d EfficientDynamics has a host of features including standard automatic start-stop, an optimum gearshift indicator, brake energy regeneration and active aerodynamics. It also has a longer final drive ratio to reduce engine revs at highway speeds, plus low rolling resistance tyres on Streamline-design alloy wheels. Yet it still accelerates from 0-62mph in just 8.2 seconds - only 0.1 seconds slower than the standard 520d. The 520d EfficientDynamics saloon also comes with BMW’s new ECO-PRO Mode. A driver-activated switch promotes economical and comfortable driving at low speeds by adjusting the engine mapping, throttle sensitivity, automatic gearshift points, where applicable, and the amount of power consumed by electrical ancillaries including climate control and heated seats. BMW has also further expanded the 5 Series line-up with the launch of the 520i and 528i. Both are powered by a new four-cylinder 2.0-litre petrol engine employing twin-scroll turbocharger technology and high-precision direct fuel injection. The 520i develops 184hp at 5000rpm and 270Nm of torque in a broad spread from 1250 to 4500rpm. With the optional automatic gearbox, average claimed economy is 44.1mpg, while CO2 emissions drop below 150g/km. The BMW 520i SE Saloon costs from £31,190 OTR - £1512 cheaper than the model it replaces – while the Touring is £33,615 OTR. By increasing the amount of turbo boost and revising the operation of the fuel injection system, the same basic engine is able to produce 245hp and 350Nm from just 1250 for the 528i. As a result 0-62mph takes just 6.2 seconds for the manual saloon, yet average official economy is 43.5mpg with CO2 output of 152g/km with the automatic transmission. The BMW 528i SE Saloon cost from £33,610 OTR and the Touring is £36,165 OTR. Meanwhile, in the 525d, a new four-cylinder 2.0-litre twin-turbo engine replaces the single-turbo six-cylinder 3.0-litre unit. The new engine generates 218hp and 450Nm of torque, sufficient to improving acceleration while reducing fuel consumption by up to 20 per cent. The BMW 525d SE Saloon costs from £35,135 OTR and the Touring £37,560 OTR. Extensive modifications to the six-cylinder twin-turbo diesel engines in the 530d and 535d, both featuring variable turbine geometry, have produced increases in power and torque while at the same time achieving greater fuel efficiency. The fuel consumption of the 530d is around 13 per cent better, while the 535d now has a power output of 313hp. These models are now priced from £38,780 OTR and £44,290 OTR respectively for the Saloon and £41,190 OTR and £46,600 OTR for the Touring. The final 5 Series engine addition for September sees the 407hp 4.4-litre twin-turbo V8 from the 550i flagship saloon and 550i GT become available in the Touring for the first time. A BMW 550i Touring starts at £54,680 OTR. The specification of the 5 Series has also been improved with the introduction of Drive Performance Control as standard. This allows the driver to fine-tune the ride and handling selecting either Comfort, Sport or Sport+ settings. It will be fitted to all Saloon and Touring variants. All four and six-cylinder 5 Series models, have the addition of ECO PRO mode, which adjusts throttle sensitivity, engine response, the upshift points with the automatic gearbox, where fitted, and even the power consumed by ancillaries including climate control and heated mirrors. Owners can now open the boot or – on the Touring – the rear window or tailgate through a simple foot movement at the rear of the car. Sensors in the rear bumper detect foot movement and if that person is carrying the correct key, messages are sent to the car’s onboard computer telling it to lift the boot lid, tailgate or rear glass hatch on the Touring. In conjunction with the optional BMW Professional Navigation system, drivers are provided with accurate, instant details of traffic conditions through the Real-Time Traffic Information system, while the uprated Head-Up display now shows full-colour road-sign graphics. An extension of the BMW Night Vision system gives better visual and audible warnings of unseen pedestrians or cyclists. September also sees the introduction of M Sport specification to the 5 Series Gran Turismo. Featuring an enhanced standard specification M Sport includes 19-inch light alloy wheels, M aerodynamic body styling, M Sport suspension and other interior and exterior enhancements. Prices for the 5 Series Gran Turismo start at £46,590 OTR for a 530d GT rising to £57,620 OTR for a 550i GT.